You know, if it’s one thing I’ve noticed over the years, it’s that many of my opinions that could be considered contrarian typically come in pairs. That is, whenever I’m not enthusiastic about a work that’s universally beloved, there’s usually another one in the same series (or made by the same people) that I end up liking despite it being glossed over by the fanbase. For instance, I like Metal Gear Solid 2 more than its predecessor and I enjoyed BioShock: Infinite much more than I did System Shock 2. 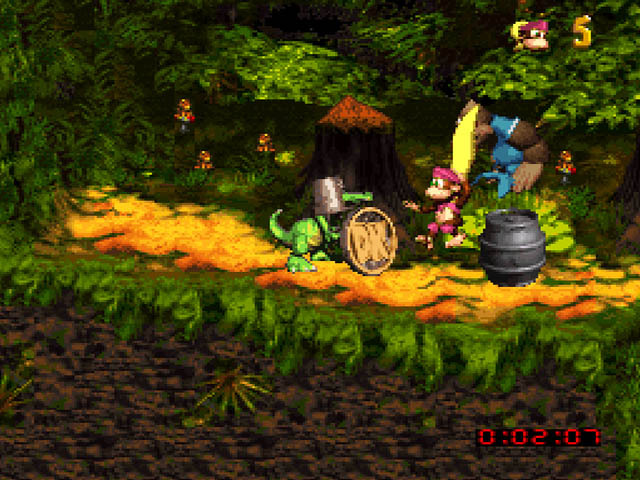 Donkey Kong Country 3 may have been the earliest instance of this happening as I feel that it’s a better game than the original despite the fanbase insisting that the opposite is true. I thought the level design in this game was better than the original, offering more disparate challenges and lacking the prototypical feel the first game. I will agree that it is a bit of a step down from its direct predecessor, but let’s face it, saying that it was a tough act to follow is quite the understatement. 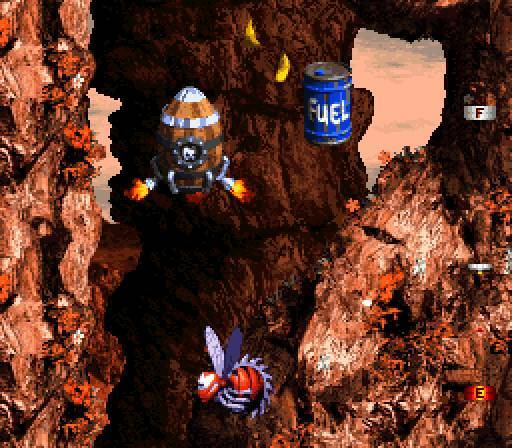 Admittedly, the gyrocopter was wasted potential if I ever saw it (even if it does give you a better incentive to find all the DK coins than DKC2 did); by the time you get it, all that’s left are a few “Simon Says” minigames. Personally, I think it would have been better if you could find a second Lost World with it. Also, not bringing DK back as a playable character was a bad idea; I’ll just say that upfront. Minor complaints aside, this game remains one of my favorite 2D platformers. It may not be as good as DKC2, but it’s undeniably a classic. Well said. I find it perfectly understandable to prefer DKC3 over the original. When I was playing through it again for this review it definitely refreshed my memory how great the game really is. I think it’s simply it’s similarities to DKC2 make it too overt how much of a “step back” it was by comparison. But don’t think that I have anything particular against the game (except perhaps the fact that David Wise’s input on the music was reduced… It baffles me to this day). Unlike a lot of people (it seems), I consider an 8.5 to be a tremendous score. And I hate to admit it, but perhaps my love for the first DKC stems from the large amount of nostalgia I have for it. I usually can separate my personal history from how well a game holds up (otherwise I’d still think Turok: Dinosaur Hunter is great), and I often roll my eyes when it seems like people lavish games on nostalgia alone. But DKC my be the one instance that proves me a hypocrite in this regard (of course, I never exactly said I was immune to nostalgia either). Having two older brothers who also love video games, I was pretty much born into the medium. Super Mario Bros. 3, Mario World, and the Mega Man titles are probably the ones I remember most from my earliest years, but I was so young at the time that they were just kind of there for me to play, I never experienced the excitement of anticipation for them. DKC was the first game I can remember being excited for and wanting to play on Christmas morning. Of course, I still honestly find DKC to be a really fun platformer, which helps. IF it weren’t any fun to play no amount of nostalgia could save it for me. Don’t worry about having some contrarian opinions, I’m no stranger to them (to say nothing of my individualist/exceptionalist worldview in today’s increasing “everyone gets a trophy”mentality). I, for example, don’t care for the Elder Scrolls games. Not because I find them innately terrible, but I find the gameplay to be incredibly slow and sluggish, which is a problem I’ve had with the series since Morrowind. Yet none of the expansions or sequels have even begun to deal with the issue, leaving me to think Bethesda is either really arrogant or really lazy when making a new entry. Many people say to download mods to make the games better, but why should it be left to outside sources to bring the game up to status quo? Shouldn’t mods simply change the experience, instead of making it work properly? Wow, I’ve really written a novel here, haven’t I? Anyway, my point is I totally understand where your coming from. It’s okay to disagree with fanbases and such, I’m no stranger to it. I understand and respect your opinion. Eh, don’t worry about making long comments; I did throw a lot out there at once. I’ve come down to the conclusion that I must have some sort of anti-nostalgia mentality. To wit, when I mentioned those five games in the previous DKC review as being the best of the nineties, I feel it’s worth noting that I only played two of those games in that decade (Donkey Kong Country 2 and Ocarina of Time). I discovered the other three games (Earthbound, Planescape: Torment, and Chrono Trigger) more than a decade after their respective release dates. Nostalgia is good, but you shouldn’t let it guide you completely. 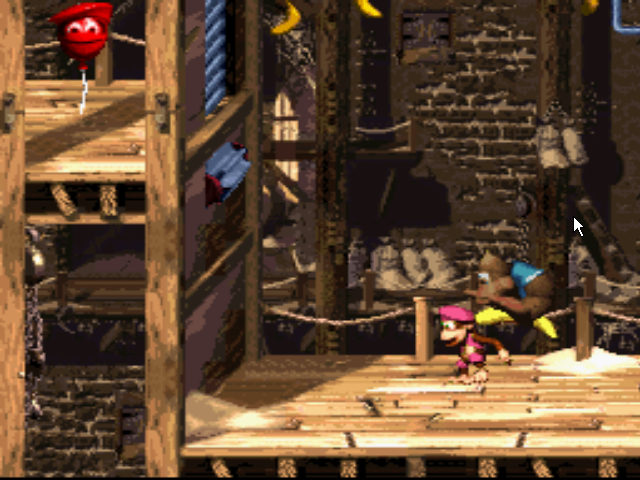 I said that DKC2 is the best 2D platformer of all time, and I stand by that statement, not because I played it back in the nineties, but because it still holds up with its expert level design and fun challenges. Meanwhile, one game I’ve played that showcases the opposite happening would be King’s Quest V. I loved that game back in the nineties and early 2000s, but these days, I’m willing to admit that it has not aged well at all what with its ridiculous puzzle solutions and awful voice acting. Actually, I have to say, I wasn’t expecting you to give DKC3 an 8.5. I remember you commenting on one of Matt’s reviews that you thought it was a major step down (or something like that), but as you seem to have indicated in your review, you’ve warmed up to it. For the record, I consider an 8.5 a high score from you as well because you’ve used all of the numbers (in other words, 1-6 aren’t just varying levels of bad). Similarly, I find I have to remind myself that that an 8/10 from me is not tantamount to an 80% on a test. You shouldn’t hate expressing a dissenting opinion to someone as long as you can do so tastefully (as you’ve demonstrated). If that person reacts badly to a well-thought-out opinion, it’s entirely their fault for reacting poorly (regardless of what their fanbase might have to say about it – several people can be wrong at once after all). That said, although I do enjoy the BioShock games, I will admit that none of them are 10/10 games. Though I think Ken Levine is one of the better storytellers in the medium, none of his works quite go that extra mile in order to achieve that distinction. It doesn’t help that the quality of his games tends to take a nosedive after the big twist. Then there’s District 9. Regardless of our differing opinions on BioShock, we are certainly on the same page when it comes to that movie. Of course, the biggest flaw with that movie is that it hinges on an extremely flawed premise. Apparently, Mr. Blomkamp expects us to believe that the same species that invented entire trade routes to get fabric from a distant land for no other reason than because it feels nice would react to a first contact scenario by throwing said aliens in the slums and not trying to figure out their technology in the twenty years since they first landed. Forget suspension of disbelief, this movie doesn’t even exist in the same dimension as the concept. As an aside, I’d say that Ex Machina is basically this decade’s District 9; it’s one of those movies that nab critics’ attention because it hits all the easiest targets. In fact, you could really explain a lot when you assume that the directors of these two movies (and a lot of recent sci-fi, unfortunately) have no idea how humans work (and the viral marketing campaign behind Ex Machina seems to only prove my point). I think an unofficial rule when it comes to my own dissenting opinions is that the less sane the fanbase is, the more likely I am to develop a point of view that completely flies in the face of their beliefs. Tangents are contagious, aren’t they? All very good points, as always. I totally understand why you might have a thing against nostalgia in games (well, not nostalgia itself, but its blinding abilities). Like I said, I also get really annoyed whenever anyone simply acts like all the games they grew up with are all better than every new game. Though I also detest when people act like anything that came before the PS2 is obsolete and unplayable. Some video games age like a fine wine, others like curdled milk. Neither is an absolute. The games I also mentioned as being the best of the 90s are also games I feel are timeless classics (which reminds me, I somehow failed to mention Banjo-Kazooie in that category). I also regard the SNES to be the best video game console to this day. Not because I grew up with it, but because it has a bigger library of classics that have proven timeless. Count me among those that prefer it to the original. 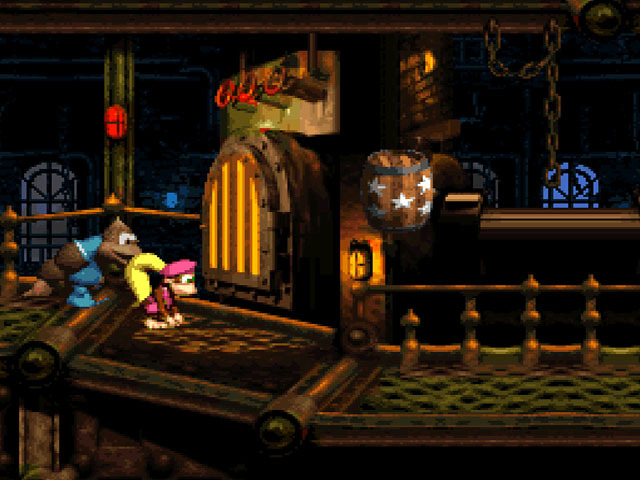 I greatly admire the original Donkey Kong Country for everything it represented (a revolution in terms of graphics, and the creation of a structure that would allow DK to thrive in the platforming universe) not to mention that it is an awesomely designed game. However, DKC3 is a huge leap forward when compared to what had been done just a couple of years before it. There’s one thing unmentioned here which I don’t think should be ignored. You mention how the graphics are more polished than ever…but this game is easily the worst designed, in terms of graphics, of the three SNES games since the system often cannot handle the game’s visuals, which manifests itself in the game’s poor performance in some levels. The framerate in the game drops significantly at times, which I don’t recall happening in the first two games (if it does, it’s not nearly to the same extent). Anyway, I am not of the mind that this game is better than the first Donkey Kong Country. DKC3 certainly improves on the original in several ways (the boss battles in the third game are much better, for instance), but every time I replay DKC3, I never have as much fun playing it as I do when replaying the first (or the second, for that matter, but I think that game’s the best of the three). There are some superficial issues I take with DKC3 (some ugly character designs, Kiddy, inferior music), but my main gripe with the game lies in how slow it feels to play in comparison to its predecessors. Not slow so much in terms of character speed (although neither Kiddy nor Dixie runs as fast as Diddy), the game is slow in terms of design. Often, it’s the product of a level gimmick (killing rats to proceed in a warehouse slows you down, a low-G environment literally slows you, dodging a target that fires on you slows you, waiting for a fish to feed on other fish slows you, etc); not all the gimmicks have this effect, and some have the opposite, admittedly, but a fair number force a deliberate slow pace on the former, quite unlike how the previous games are designed. Even one of the bonus games (Collect 15 Green Bananas) is slow, forcing you to wait; the DK coins force you to stop and kill a Kremling before you can get it, and often the puzzle to defeat the Kremling is so simple that it feels almost pointless (the DK coin may as well just be floating there). The Brothers Bear add more content to the game, but, to me, they often just feel like an impediment that delays access to bonuses and game progression, as the puzzles they present are simple, easy to figure out, and usually do not require you to perform any platforming expertise to complete (the only exception I can think of is the bear whose record time on a level you must beat in order to proceed–I wish the other bears demanded similar challenges from players). Then, as I mentioned, in addition to these gameplay mechanics, the game suffers from the odd performance issue that literally slows the game. 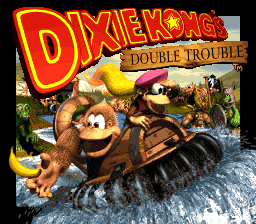 Still, I don’t think the first DKC is that much better than this game. As others here have discussed, the first has lousy bosses (except for King K. Rool) and the bonuses are poorly implemented (too often, you need to take blind leaps into pits, and the rewards for completing bonuses do not incentivize the player to seek them out). Nonetheless, I find the core gameplay of DKC to be better in some key aspects, namely in terms of how the game flows at a relatively rapid rate. I based this review off of replaying DKC3 on the Wii U’s Virtual Console, and I can’t say for sure if that release touched up on the framerate issues, but I don’t recall encountering any notable issues during my playthrough. Hopefully I’ll get another SNES copy of the game and I can compare. While I agree that the DK Coins needed some more variety in how to get them, the other gimmicks didn’t bother me so much. True, you move along slower because of a lot of them, but I’ve always preferred a savored experience over speedrunning anyway, so that doesn’t really change anything for me. Sure, it’s different from the first two, but when you get to a third entry (especially in a case like this when they were released a year apart), it can be a good thing to differentiate. However, the goofy enemy designs and huge downgrade in music are a shame. The slow pace is an aspect of the game that I don’t care for but could also be a reason other people like the game. I’d imagine the framerate dips are also on the Wii U version, since it’s emulating the original; the slowdown does not happen in most levels, as it only occurs when there are too many objects on the screen at one time for the game to handle. Barrel Drop Bounce and Pot Hole Panic are some notable levels where it can occur. I like some of the game’s gimmicks (the first Lost Level where the elephant runs the entire time is cool) but it gets to be a bit too much for me at other times (the swimming level with reversed controls is just annoying).